Fahrenheit Herbicide! A Group 1 and Group 2, 38 percent water soluble granule for the control of broadleaf and grassy weeds in labeled warm-season turfgrasses. Profitability – A little goes a long way. The low cost of this Dicamba + Sulfonylurea (SU) herbicide formulation provides high-performing and affordable weed control. Versatility – Safe formulation for warm season grasses means you can use Fahrenheit on your course and around your clubhouse. Simplicity – One bottle treats one acre. No more complicated dilution ratios. 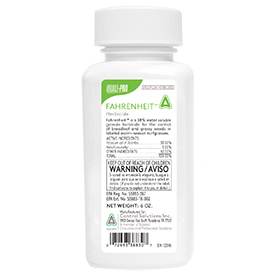 Flexibility – Fahrenheit produces results in temps as low as 50 degrees. Efficacy – Controls weeds faster with two different modes-of-action.